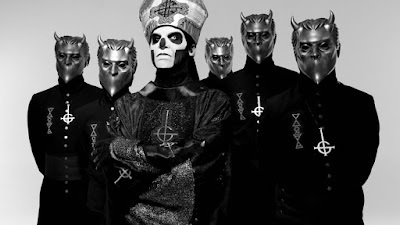 According to news out of Sweden, Ghost frontman Papa Emeritus (Tobias Forge) is being sued by four former members of the band in a dispute over financial issues. Corren.se reports the musicians - billed as Nameless Ghouls in the lineup - are seeking compensation for unpaid wages as part of what they claim to be a business partnership agreement between all five parties that was signed when the group formed in 2008. While the documents allegedly indicate Forge was to oversee the business management of Ghost, the former members say they worked for years while receiving compensation on a sporadic basis as Forge advised them that the company was not profitable. The band debuted its new lineup of Nameless Ghouls at the launch of a spring European tour in Norwich, UK on March 24. Ghost recently announced that they will play a series of US headline dates during this summer’s North American tour with Iron Maiden, which will begin in Bristow, VA on June 3.